Ancient wisdom has it that the hearth is the heart of the home, and these modern products are a baker's delight. 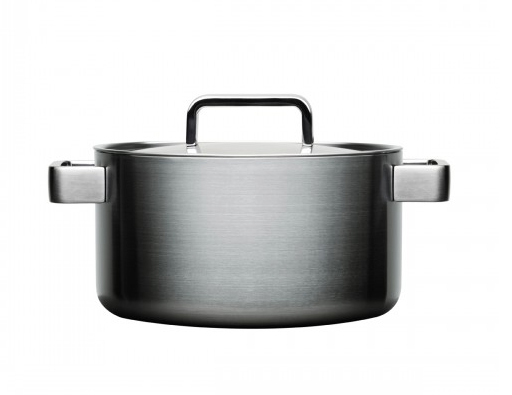 Designed by Björn Dahlström for Iitala, the Iitala Tools Casserole stainless steel pan features sturdy steel handles and holds up to 8 quarts. It is also available in the Dwell store. Available in the Dwell store, these Nest 9 Plus polypropylene and plastic nesting measuring cups by Morph for Joseph Joseph are durable and suited for precise and colorful cooks. The Enameled Cast Iron French Oven by Le Creuset is a classic. Available in bright hues like this sunflower yellow, the cast iron oven boasts a chip-resistant interior enamel and ergonomic handles. Menu's ceramic Stackable Oven Dishes have evolved. Their silicon legs help them adapt from oven to table. Heat-protective polyester filling ensures that this colorful cotton mitt can protect its wearer from the oven's searing, sizzling heat. Available in the Dwell store, the Tilkkutakki Oven Mitten was designed by Maija Louekari for Marimekko. Normann Copenhagen's felted wool Kula trivet designed by Bryndis Bolladottir cushions tables and hard surfaces, sheltering them from the heat of pots and pans fresh from the oven. The vivid hues of Jansen+Co's ceramic cake stand celebrate any and all culinary triumphs, raising them up above the kitchen crowd. With its 3 ovens constantly circulating heat, the cast iron Aga 3 Oven Cooker allows devoted culinary aficionados to cook without end. The silicon Cake Form by Vessel divides cake into 15 different serving sizes, accomodating all styles of cake lover, from those who prefer a nightly sliver to those who indulge with larger slices. Though not the most glamorous item on this list, the Thick Chambray Linen Kitchen Cloth by YUMIKO SEkINE for Fog Linen Work available in the Dwell store is certainly an essential. Machine washable and dry able, the linen kitchen cloth is prepared to meet mess after delicious mess.